Dene and Métis in Norman Wells, N.W.T., are one step closer to reaching a final agreement for self-governance after signing today's agreement in principle. Dene and Métis in Norman Wells, N.W.T., are one step closer to reaching a final agreement for self-governance after signing an agreement in principle Wednesday — making them the first group representing Métis in Canada to reach that milestone. 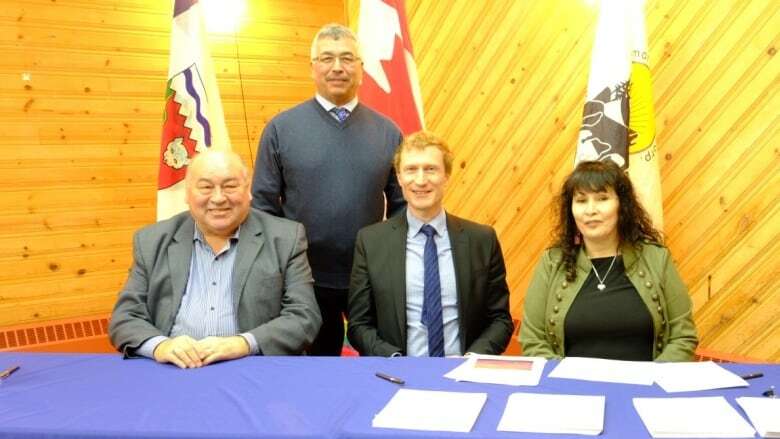 Representatives from the Norman Wells Land Corporation and both territorial and federal governments celebrated the signing of the Self-Government Agreement-in-Principle for the Sahtu Dene and Métis of Norman Wells Wednesday evening. The celebration was held in the community of about 800 people, 37 per cent of which self-identify as Indigenous. "Our goal was to ensure that the rights of the Sahtu Dene and Métis of Norman Wells are preserved and protected for future generations," said Sherry Hodgson, president of the Norman Wells Land Corporation, in a news release Wednesday. "We have travelled many, many miles on that journey." The Sahtu Dene and Metis Comprehensive Land Claim Agreement was signed in 1993. That paved a way for N.W.T. 's Sahtu communities like Deline, Norman Wells, Colville Lake, Fort Good Hope and Tulita to pursue self-government agreements. 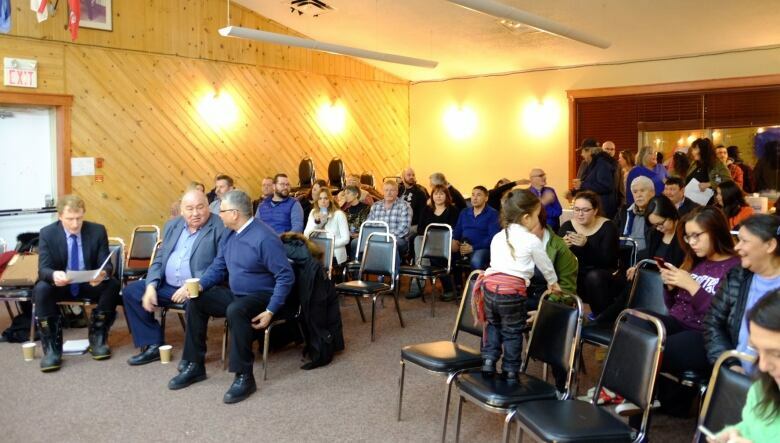 Deline was the first Dene community to achieve self-governance in 2014. Hodgson was joined by N.W.T. Premier Bob McLeod and Marc Miller, parliamentary secretary for the federal Department of Crown-Indigenous Relations, on Wednesday. "This agreement in principle is a significant step," said McLeod, addressing a crowd at the Royal Canadian Legion in the community Wednesday. "Today's milestone and achievement is something that should be celebrated by all northerners." The agreement in principle is not legally binding; it's a foundation for negotiations for a final agreement. CBC has not yet seen the text of the agreement-in-principle as it's undergoing negotiations. The Norman Wells Land Corporation — which represents the Métis and Dene in the community — will become the Tlegohli Got'ine Government, according to the latest news release. It means "the government of the people where the oil is." The new government could have the power to collect taxes, decide on membership and run their own child and family services, among other things. If the agreement in principle is implemented as part of a final agreement, the new government will only govern over members of the land corporation. However, if the population of Norman Wells becomes 70 per cent Indigenous or more, the Town of Norman Wells could dissolve and the Tlegohli Got'ine Government will become the public government of the community, officials with the federal and territorial government confirmed to CBC. The self-government agreements fall under the Sahtu Dene and Metis Comprehensive Land Claim Agreement, signed in 1993, which paved a way for Sahtu communities like Deline, Norman Wells, Colville Lake, Fort Good Hope and Tulita to pursue self-government agreements. Now that the agreement in principle is signed, the next step is signing a final agreement — which could potentially take years. The final agreement will give the Dene and Métis of Norman Wells "more control over decisions that affect their day-to-day lives," and also describe how the new self-government will work together with both territorial and federal governments, according to a news release Wednesday. In the release, three areas were identified as main areas of concern for negotiations going forward: how the government would be financed, how the changes would be implemented, and what taxation powers the new government would have — including whether it could levy taxes of its own. Working groups have been established on all three. New regional Métis organization in the works in N.W.T.